Find your perfect alternative wedding rings. The BEST! British made men's, and women's alternative wedding rings all designed and made here in the UK from titanium, zirconium, gold, silver, steel or wood. We have carefully chosen a wide variety of quirky style wedding ring choices, from chunky stainless steel and titanium to the precious metals of gold and silver, so you should find a wedding ring here to fit your taste. Many of the rings are suitable for wedding sets, so they match each other but are designed to look right no matter what the finger size. 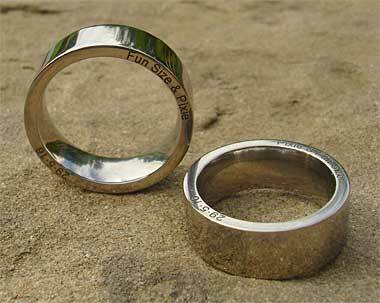 As all our wedding bands are made here in the UK, the designers can make sure they get this exactly correct for you. All you need to do is get your finger size correct which we can help you out with right from the start. We are more than happy to help you choose your unique wedding rings and offer you FREE advice along the way. On a final note we are very confident in that not only do we provide the BEST wedding rings made here in the UK (and probably the world) but also at the LOWEST PRICES too. If you think you may have seen the same wedding ring elsewhere at a lower price, let us know, and we will price match like for like. YES! We can BEAT anyone!